Michael Haverluck, OneNewsNow, says Sheriff Clarke believes Black Lives Matter is all politics. And yes, he’s Black through, and through. Clark unceremoniously slammed Obama after his many derogatory comments, seriously dividing the nation similar to the Civil War. Milwaukee County Sheriff David Clarke tore into Black Lives Matter for being nonexistent during Louisiana’s historic flooding, saying this activist movement is all about political power, not Black lives. He also ripped into Obama for his terrible response to the flood victims. Clarke stressed how Obama was conspicuously absent while the majority of predominantly Black American cities devastated by the torrential flooding, like Baton Rouge, were desperate for assistance. 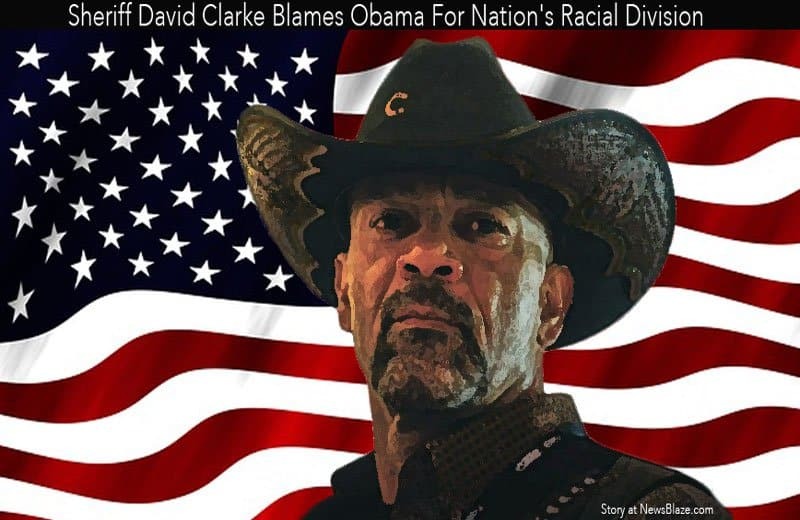 Clarke put the blame for America’s racial division on Obama, saying all violence and animosity between Blacks and Whites has come down from the president. He also noted Obama’s delay to victims in the flood zone was purposeful not to shorten his vacation. “Obama views everything through the prism of race,” Clarke pointed out. “He’s a race hustler. He engages in race politics.” The Milwaukee sheriff also accused Obama of believing himself being above any fellow Blacks, citing his decision to remain on vacation in Massachusetts, while Trump was distributing supplies from an 18-wheeler around Louisiana’s flooded-affected areas. Milwaukee County Sheriff David Clarke. Clarke also mentioned Black Americans were being “hoodwinked” by Democrats, since progressive policies have only fueled inner-city violence in Milwaukee and other cities around America. “Their failed urban policies have wrecked the city of Milwaukee – the city that I grew up in.” Clarke also mentioned the heavy loss of jobs, a failing education system and a surge in the number of dysfunctional families. He emphasized Milwaukee is highly affected by Democrat policies, as well as Chicago, Baltimore and St. Louis are other urban areas “on the brink” of exploding into more racial violence. Virginia Gov. Terry McAuliffe promised to use an executive order to restore voting rights to felons, an announcement leaving the Republican-dominated legislature – some of whom have opposed an overturn of the Civil War-era prohibition – in the cold. From the New York Times: “The sweeping order, in a swing state that could play a role in deciding the November presidential election, will enable all felons who have served their prison time and finished parole to register to vote. By the numbers, more than 200,000 felons could see their voting rights restored – most of whom are Blacks,” the newspaper reported. A Washington Post editorial published this year referenced a 2007 quote from then-Senator Obama. He said “we have more Black men in prison than we have in our colleges.” For nearly a decade, this statement has been popular with those attempting to illustrate the plight of Black males. Unfortunately, this is quite simply, untrue. This is a statement from a 2000 report from the Justice Policy Institute. However, the statement was never accurate. 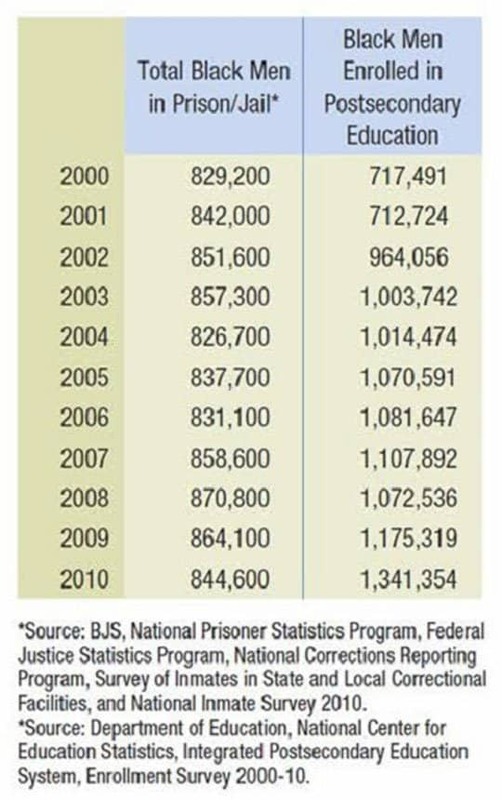 This table compares incarceration and higher education enrollment data between 2000 and 2010. The college enrollment data used in Cellblocks or Classrooms only counts African-American males attending degree-granting institutions who enrolled for the fall semester. The actual information is detailed in the chart above. The author’s best friend from high school was Black, and always an outstanding student. In fact, most Blacks are great people. But some have turned to the Dark Side. Some Blacks like Colin Kaepernick simply kneel to show utter disdain for the Star Spangled Banner. Kaepernick blames every white American for racial injustice. Quarterback Colin Kaepernick, who makes more than $11 million a year under his current contract with the San Francisco 49ers, said he will donate $1 million to support organizations against racial injustice and police brutality. Even more so, he blames police brutality as the major cause of more Black unrest. Why does he not realize that police are only there to protect Black and White lives? If police feel it’s necessary to begin shooting to save the general populace, they will do so. Police follow the direction that severe treatment will only be served on unruly and violent characters. In fact, the same rule applies to misbehaving Whites as well. But latent feelings tend to ramp up belligerency. Unfortunately, statistics say Blacks will vote approximately 90 percent Democrat. How can that be? Fortunately, many more Blacks seem to be coming to their senses. Most polls indicate more Blacks will vote Republican – possibly up to 30 percent this election.